There are times in the bird photography world where content trumps quality. Whether it be difficult lighting conditions, like a dreary and rainy day, or the bird is just too far away for a good shot. 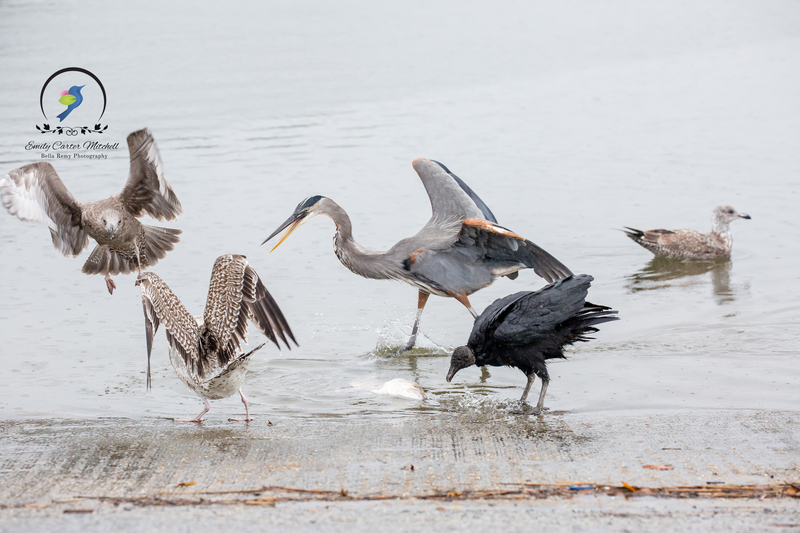 Like this Great blue heron and Black Vulture that were drenched from the rain. Shaking it off and spreading their wings to help dry off is one of the behaviors seen in the avian world. Spending hours upon hours observing birds, I’ve become familiar with some of their behaviors and can only hope that I can capture them in action. Sure, there are plenty of beautiful images of a “bird on a stick,” but I look for something more. Something that shows a sense of humanity. Something that shows their surroundings, and their lives. 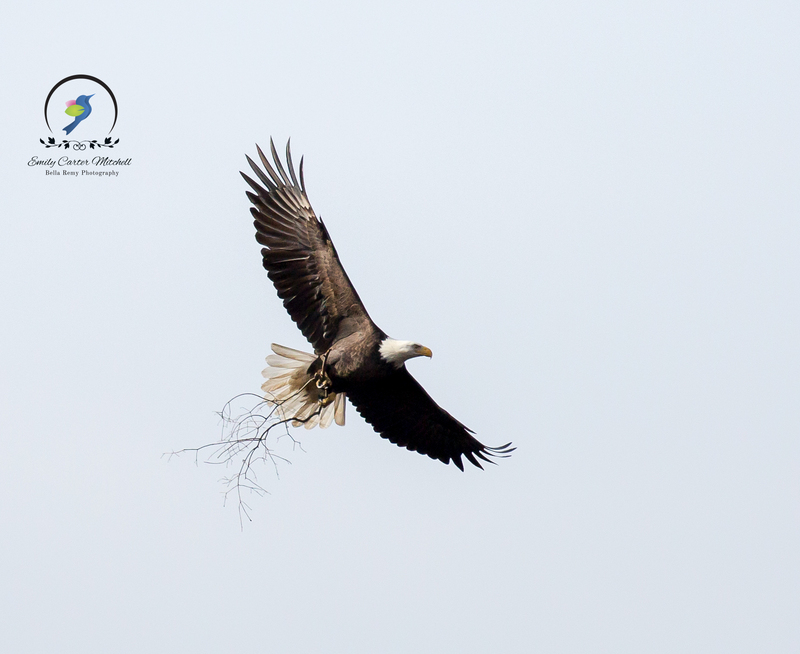 Like this Bald eagle that was gathering nest material and flying off to parts unknown tucked in the woods far away. Sometimes you get a rare sighting that can only be seen once in a lifetime. While in the rain, I had driven to the marina at a local park. There was a grouping of mixed birds surrounding a fish. The center of attention, the black vultures had first dibs on it. Somehow they had enlisted the Great blue heron to be their bodyguard and he stood the ready to fend off any gulls that attempted to come in for a bite. But one of the oddest things I’ve seen recently was at Swan Creek Wetlands in Curtis Bay, Maryland. 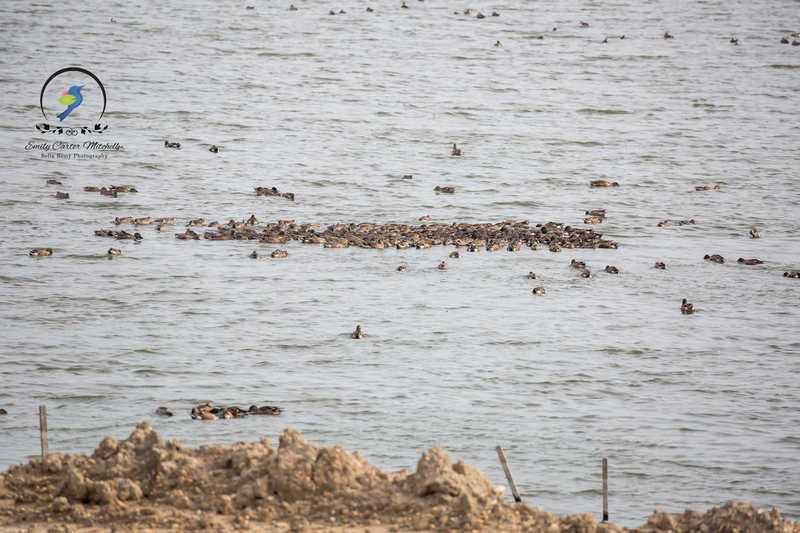 It was a grouping of about 100 Northern shovelers (a type of duck) that were in a tight raft, circling counterclockwise. In continuous motion all I could do was wonder what it was all about. Some would leave and others would join the group. Come to find out, what they do is kick up the mud so that they can sift through the silt with their long bills for sustenance. This feeding behavior is usually seen with a few shovelers, but seeing this many is a rare event. Beautiful and delightful photos as always :-). Thanks for explaining the Northern Shoveler circling behavior. I’d been wondering. I’ve only seen two at a time do it. Very cool that you witnessed a “mass circling” event! Thrilled that I could share this experience with you. It truly was a special moment. I think someone called them “Swirling Shovelers.” Isn’t that great? Thanks Myriam. They do create a water swirl :-)! Amazing photographs Emily – seems like the birds were waiting for their photo shoot with you! You are truly so kind Mary. Keeping an open mind and an open heart has shown me the beauty of mother nature. What unbelievably, FABULOUS moments you have been witness too – those Shovelers churning up the mud are just incredible! That was the craziest thing I’ve ever seen. I was next to 3 other seasoned birders. They had never seen it either. Thank you Joanne. Wonderful photo series, it really does convey the spirit of these amazing creatures. Thank you Charlie ! Indeed the birds never cease to amaze me. Lovely and unique captures, Emily! Loved every single one of them. You are too kind Tiny. Thank you!